Brownies are definitely America's favorite bar cookie. It is hard to believe that they began their life in a Sears, Roebuck and Co. catalog over 100 years ago (1897). 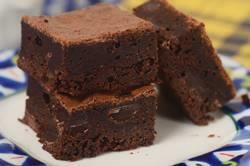 Brownies are so named because of their dark brown color, not because they contain chocolate. In fact, the first brownie recipes didn't even contain chocolate. In Fannie Farmer's 'Boston Cooking School Cook Book' the Brownie recipe calls for butter, sugar, Porto Rico molasses, an egg, flour, and pecan meat. So, I think we can safely say that our Brownie has evolved over the last century. This Brownie recipe does contain chocolate, lots of chocolate, both semi sweet (or bittersweet) chocolate and unsweetened cocoa powder. So it has a deep chocolate flavor with a wonderfully moist texture. They are wonderful plain or I often serve them for dessert with a scoop of vanilla ice cream. Brownies are made using just one bowl. First the chocolate and butter are melted and then, one by one, you whisk in the rest of the ingredients. The deep chocolate flavor of these brownies comes from using semisweet or bittersweet chocolate and unsweetened cocoa powder (either natural or Dutch-processed). As always, the quality of the chocolate you use will affect the taste of your brownies. So buy the best you can afford. When choosing a chocolate, always buy one that you enjoy eating out-of-hand. Look for chocolate that has a lovely shiny finish (a sign that the chocolate was cooked at the right temperature for the right amount of time) and one that has that wonderful 'snap' when you break it into pieces. Although this recipe calls for adding chocolate chips to the batter, you could substitute nuts (chopped walnuts or pecans) for the chocolate chips or just leave them out altogether. Now, the challenge with all Brownies is how long they should be baked. It is amazing how just a minute or two will turn a moist brownie into one that is too dry. So use the stated baking time as a guide only and test the brownies a few minutes before the end of the stated baking time. Test with a toothpick inserted into the center of the brownies. These brownies are done when the toothpick still has a little batter clinging to it and a few moist clumps. You do not want the toothpick to be clean as this means the brownies have been over baked.